By special request, our new unit is Outer Space and the kids are loving it! Later in the unit I’ll be introducing a Goodnight Moon bin as well. Marbles, jacks and poms can usually be found at the Dollar Store, if you don’t already have them on hand. We use a large bin, 20×16, if you have a smaller bin 2-3lb beans should be sufficient. Enjoy! 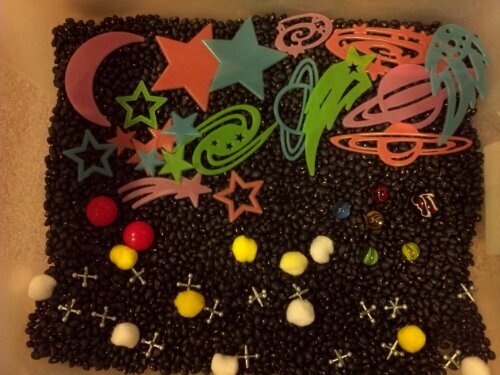 This entry was posted in Sensory Bins, What We're Learning and tagged Beans, outer space, planet, Sensory, star. Bookmark the permalink.